First phase of imperialism’s direct intervention in Venezuela has started. 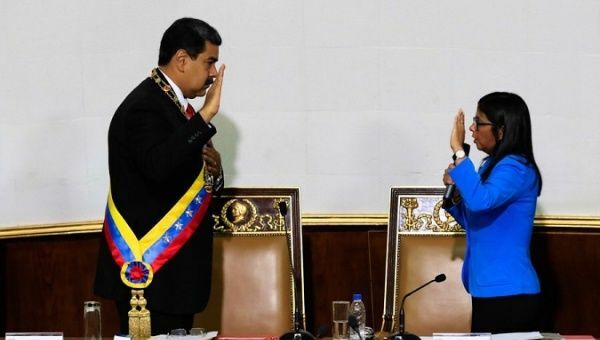 The US has “officially” recognized a self-proclaimed president of Venezuela as the country’s president while the rightists are trying to create chaos on Caracas streets. Guaidó, the self-proclaimed president, have been recognized by Argentina, Brazil, Colombia, Chile, Costa Rica, Ecuador, Guatemala, Paraguay and Peru, the countries collaborating with the US imperialism, followed the imperialist power within two hours of the US move. The Organization of American States (OAS) has also recognized Guaidó as president. Canada and France have extended its support to Guaidó. European Council president Donald Tusk expressed hoped the EU would “unite in support of democratic forces”. The imperial alliance is active. Guaidó, an obscure lawmaker a few days ago and head of the National Assembly, called on the armed forces to disobey the constitutionally formed government of Venezuela. However, Venezuela’s defense minister has condemned Guaidó, a former student leader participating in protests against socialist leader Chavez. Nicolas Maduro, who was sworn-in as president of Venezuela earlier this month, has declared breaking of diplomatic and political relations with the US. The measure is in response to Trump’s recognition of Guaidó. Venezuela has given the US diplomatic staff 72 hours to leave Venezuela. Maduro has declared all US diplomats persona non grata, after the imperial power recognized Guaidó as Venezuela’s president. US secretary of state Pompeo rejected Venezuela’s move to cut ties with the US. Pompeo said the US did not recognize Maduro as leader of Venezuela. He said the US would conduct relations “through the government of interim President Guaidó” although there’s nothing like “government of President Guaidó”. Pompeo also urged Venezuela’s military to support efforts to restore “democracy”, and said the US would back Guaidó in his attempts to establish a government. Venezuela’s foreign minister lashed out at “subordinate clowns” who he said followed the “owner of the imperialist circus”. Mexico and Cuba also have expressed support to Maduro. Already there has appeared the Venezuelan Observatory of Social Conflicts. More such organizations and “opposition voices” will be organized and heard. They will provide figures – number of wounded and death, number of incidents of looting market places, number of incidents of arson, and similar many others. There will appear voices of “conscience”, a part of which will be comprised of elements claiming to be “left” and “progressive”. These “left-progressive” elements will turn dear friends of and reliable sources of information for the mainstream media. Is the self-proclaimed president above constitution of Venezuela? Shall this incident be cited as a precedent in cases of other countries whenever imperialists will feel that that country is moving away from its orbit? It’s a dangerous precedent set by imperial powers. It’s dangerous not only for the people of Venezuela, but for other countries also; because, imperialists can arrange similar set up of opposition/demonstration/claim to the seat of power in cases of other countries trying to move in a dignified way through a road fitting to the country’s need. Imperialists don’t consider constitution of other countries. Imperialists consider they are the guardians of political practices and norms of all countries; and they stand above all constitutions of all countries. Imperialists know best – which political system is best suited for people of any country; leading imperialists claim to rights above rights of people. Who knows when which country will face imperialist wrath? Do the “progressive” and “lefty” “friends” looking at political incidents in countries through a black or white lens know? They examine the Bolivarian revolutionary process through that black or white lens, and they turn frustrated as they fail to find “great” bourgeois “democratic” practices there. They deny looking at the reality and limitations – essentially contradictions – in the society struggling for transformation. Thus they, at times, miss imperialism’s role there as they miss in other countries while they appear great crusaders for “democracy”. But the holy hearts don’t question: Why imperialism denies targeting them, the “brave fighters”, but target Venezuela, Chavez, Maduro? Today’s direct imperialist intervention in Venezuela has not been organized overnight. So-called democratic forces were organized, trained, financed and armed slowly and clandestinely over a long period. Simultaneously, tarnishing image of Venezuela/Chavez/Maduro/the Bolivarian Revolution was carried on unceasingly, and a negative impression was constructed among wider international audience while an economic war against the Revolution was organized. The Venezuelan people’s sufferings due to imperialist intervention were portrayed as failures of the Revolution. There are cases of cancer patients – young, promising, old, infirm – facing death due to lack of essential drugs/equipments, which was due to imperialist economic war against the Revolution. Nevertheless, those stories go missing in the MSM. So, one of the burning questions today: Shall this imperialist intervention succeed? The broad answer: It depends on the Revolution’s capacity to mobilize the people in the land of Bolivar. To be specific: Venezuela is not Chile of the time preceding murderer Pinochet’s coup backed by the imperial power. Today is not the days of imperialism’s Libya intervention. Today is not the days of betrayer Gorbachev. The imperial power has its own deeper and wider problems, however. This condition of imperialism may advise it to resort to provocative acts – hot intervention, which is directly sending armed persons – to divert attention of people in its country. Or, with a cautious attitude, imperialism may try to mobilize proxies to intervene in Venezuela after creating a serious bloody situation – a lot of deaths, a lot of cases of arson, use of petrol bombs and homemade firearms, a serious law and order situation.